The Manley Stereo Variable Mu® Unit Identification — Manley Laboratories, Inc. The Manley Stereo Variable Mu® Limiter Compressor has been in production since 1994 and all builds of these over the years all very similar. However, as expected for a model that has been in production this long, there are some mechanical and electrical differences between the units, and we have broken them down into four basic groups. If you are considering modifying your unit to utilize Paul's special "T-Bar" Mod, you will need to know which version you have in order to get the right kit. As there can be some overlap between production versions, serial numbers alone cannot be used to identify which Version you have. It is best to visually inspect the guts of your unit to really know which Version you have. The serial numbers will give you a rough guide only. Take a peek inside by removing the top cover and try to figure out which Version you have by matching what you see with the following descriptions. If you are unclear as to the version you own after reviewing the layouts and descriptions of all four types (or you have a Mastering version, which has a different serial number sequence), then contact Paul in our Service Center and he will assist you. This is best done by filling in the Service Request form here. Here's another Version One unit that has been upgraded with Manley Magnetics input and output transformers which have been remounted as described below. The two separate B+ transformers were also replaced with MCI manufactured ones. Also you can see this unit has the heater bridge diode moved to the side of the unit to improve heat dissipation for it. 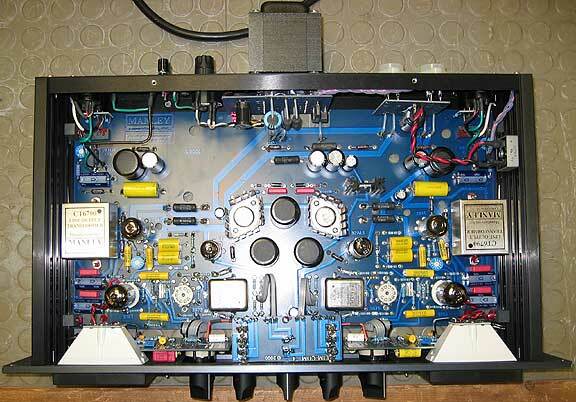 VERSION 2: Uses 6386 input tubes, 7044 output tubes, rectangular (Manley brand) input transformers. They have 3 power transformers inside. Two 8 Ohm heater voltage dropping resistors are used for each 6386 tube. These units originally had the input transformers mounted flat on the circuit board. Units that have been returned to the factory for service have had their input transformers replaced and re-mounted in a vertical configuration at about a 30 degree angle to improve noise issues. Version 2 units were produced from 3/1996 until 6/1996, serial numbers MSLC7124 through MSLC7242. Requires adapter board #12-2. VERSION 3: Same as Version 3, except uses 5670 input tubes instead of the 6386. All these units were supplied with Manley input transformers, and most were mounted vertically at about a 30 degree angle. Produced from 6/1996 until 10/1997, serial numbers MSLC5243 through MSLC5569. Requires adapter board #12-34. VERSION 4: Easy to identify, as it has only one power transformer which protrudes about 3" from the rear of the unit. Built from 10/1997 to 2/2004, serial number MSLC5570 - MSLC5576 then MSLC6577 and up to around MSLC61673 are all Version 4. (Except any unit with a 7-prefix is a Version 2, and any unit with a 8-prefix is a Version 4a). Requires adapter board #12-34. VERSION 9: Produced 6/2013 to present, serial numbers MSLC9#### have a new PCB layout improving heat management and build efficiency. Also, the hardwire bypass is done by relays at the XLR jacks reducing about 20" of Mogami wire in the audio path. For T-Bar Mod, order adaptor board #12-34. PLEASE NOTE: Due to overlapping production runs, special order units, parts availability, etc. it is sometimes difficult to determine exactly which version you have by serial number and date alone. It is usually best to remove the top cover, check the input tube type, and notes on this page and compare your unit to the drawings which are shown in the installation instructions for the four versions.